You are currently browsing the tag archive for the ‘Andrea Carcano’ tag. Cleveland’s Severance Hall was included in the eight-city American tour of the Antonio Stradivari 1726 “Ex Adams Collection” violin played by Matteo Fedeli with pianist Andrea Carcano. Presented by The Consulate of Italy in Detroit commemorating the Year of Italian Culture in the USA 2013, the program of short pieces served well to show off the rich qualities of the coveted instrument. Fedeli is councillor, associate founder and has been first violinist of the Academy String Concert Orchestra of Milan since 1995. 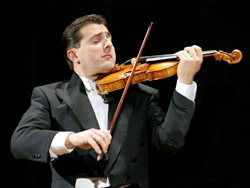 Known as “the man of the Stradivarius,” he was a charming and enthusiastic ambassador, providing spoken program notes from Reinberger Chamber Hall’s stage.